Sometime, somewhere, someone lost a mitten: a black fleece mitten with a brown design. 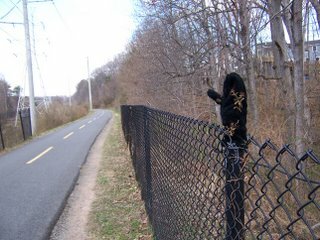 Sometime, somewhere, someone else found the mitten and stuck it on a fence between Milepost 12.5 and Milepost 13 on the W&OD Trail. It stands boldly upright, greeting the westbound traffic with a jaunty air. It’s the Hailing Hand. Since it was so windy today, I wondered if perhaps the Hailing Hand had been snatched from its perch and was tumbling through a nearby field. But no; it was still firmly attached to the fence this morning, its head bent just a little against the wind. If it stays there through forty mph gusts, I’m guessing it’s there for good – unless some person with no sense of whimsy takes it off. Time, weather and nesting birds will no doubt take their toll on the Hand, but for now it’s a cheerful greeting to those trekking the trail. There is an unwritten rule on Capitol Hill that when you find something you stick it on a spike of one of the fences enclosing the ridiculously expensive historical hill homes. So you see key rings, scarves, random baby toys, and lots and lots of mittens perched on fences around here. I like when I see it because it reassures me that some times, some places, people are remarkably honest and good. Thanks for stopping by, SAS. I’ve read your blog and I like it.